[THE FACT] The group g.o.d went into the countdown of their comeback before the release of the 20th anniversary special album. Sidus HQ, agency of g.o.d, has released the track lists of the 20th anniversary album ‘THEN&NOW’ through an official disclosure on the 10th. The track list contains a total of 10 songs including the double title song ‘Leave Him’, ‘Eye to Eye’, and new songs with g.o.d’s emotions together with the remake versions of their old songs as well as ‘Road’ reborn by IU, Henry, Yang Dail, etc. The title song ‘Leave Him’, that has been known to meet JYP for 14 years, is a medium tempo R&B Hip-hop song about a guy wanting his beloved woman to return while his heart hurts to see her having hard time because of another man. The double title song ‘Eye to Eye’ is a medium tempo pop ballad song with a rich string line and piano. Denian participated in the lyrics and added more meaning to the song and the lyrics is characterized by a total of 43 titles of g.o.d hits and members’ solo songs as well as the OST of a drama starring Yoon Kyesang. g.o.d members selected and remade their favorite songs of the previously released albums such as ‘I Know’ by Park Joonhyung, ‘So You Can Come Back to Me’ by Yoon Kyesang, ‘Why’ by Denian, ‘Don’t Know’ by Son Hoyoung, ‘Where You Should Be’ by Kim Taewoo. g.o.d said, “We were curious how it will be if the songs beloved by fans will change to the styles nowadays” as a reason of the selection and produced themselves by putting their own colors. 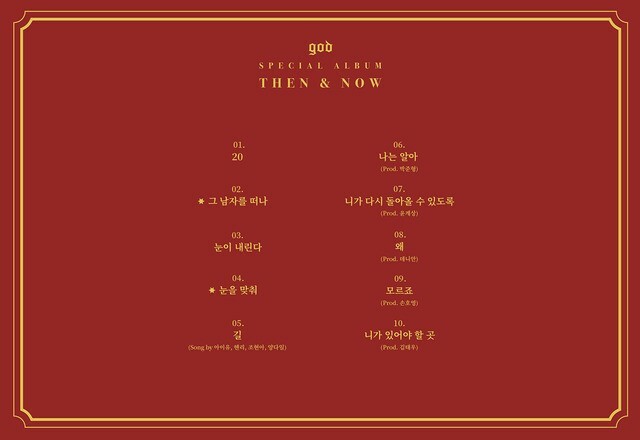 The 20th anniversary special album ‘THEN&NOW’, containing the g.o.d’s warm emotions and trendy colors together with the love and effort for the fans, has been released at 6 pm on the 10th afternoon.